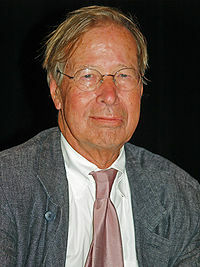 Ronald Myles Dworkin, FBA (December 11, 1931 – February 14, 2013) was an American philosopher and scholar of constitutional law. He was Frank Henry Sommer Professor of Law and Philosophy at New York University and Emeritus Professor of Jurisprudence at University College London. He also taught at Yale Law School and the University of Oxford. He was born in Providence, Rhode Island. Dworkin died from leukemia on February 14, 2013 in London, England. He was 81 years old. He was outlived by his second wife, two children and two grandchildren. ↑ "Ronald Dworkin, Legal Scholar, Dies at 81". The New York Times. February 14, 2013. Retrieved March 24, 2014. This page was last changed on 31 August 2017, at 11:03.